That’s not to say that Americans’ quality of life hasn’t improved in some ways. Consider the dramatic increase in the square footage of U.S. houses over the past 30 years or the enormous strides in medical technology. In today’s strengthening economy, the Federal Reserve Board reports that a majority of adults say they are doing okay or even living comfortably, and they are feeling more optimistic. Yet this doesn’t entirely square with another of the Fed’s findings: a large majority of adults would not be able to cover an unexpected $400 expense without selling something or borrowing money. Quart contends that a growing share of workers’ incomes are consumed by the essential expenses that have increased rapidly, namely housing, college, and health insurance. The federal Consumer Financial Protection Bureau (CFPB) agreed that these same costs have created a growing economic divide between the country’s haves and have-nots. One-third of workers in CFPB’s 2017 survey said they are barely making it and another third aren’t exactly thriving. Squeezed devotes considerable time to the high cost of raising children. Infant care, at $10,000 per year, falls hard on most families. But she notes that the growing ranks of single mothers mean that more parents are finding it extremely difficult to afford full-time day care on a single income. One in four women today are their family’s breadwinner, yet the vast majority of middle-class women earn less than $75,000. Quart sometimes reports on workers’ lives in numbing detail. But it is these details that bring home to readers the financial struggles of regular people. A mother of two works two retail jobs and requires day care for both shifts: from 8 a.m. to 2 p.m. at a supermarket and from 6 p.m. to 10 p.m. at Home Depot. Neither job provides the hours required to qualify for health insurance from her employers. “I need more money to be surviving,” she says. Or consider teaching, which used to be a profession chosen by working-class people with middle-class aspirations. But today grade school and high school teachers are striking over pay and moonlighting as Uber drivers to stay in the middle class – Uber has even pitched this as an option in company-produced videos. Indeed, a 2017 study of checking account activity found that most people are participating in the gig economy – whether Uber, AirBnB or eBay – not as full-timers but as a part-timers supplementing their regular income. For many better-paid members of the middle-class, well-being can be a function of where they live. A father whom Quart profiles earns $100,000 but has difficulty paying his bills. That’s because he lives in a $680,000 “starter home” in the San Francisco Bay Area, where the housing market caters to the 1 percent, who push up everyone’s cost of living. Renters face a similar situation: burdensome rents are “the new normal” in U.S. cities, concluded a 2017 report by Harvard University’s Joint Center for Housing Studies. Quart argues that financial struggles often go hand in hand with psychological degradation. “Being squeezed involves one’s finances, one’s social status, and one’s image,” she writes. She identifies the problem of “extreme schedule stress.” The average full-time job requires workers be on the job 47 hours per week – not 40 hours, as is usually assumed. The Federal Reserve reports that one in six workers has irregular work schedules and one in 10 gets a schedule from their employer less than a week in advance. One beneficiary has been round-the-clock daycare centers, which is a growing business that reflects “the upheaval in American work lives,” she writes. It’s human nature to blame oneself for economic hardship – a poor career choice, not working hard enough, spending money on frivolous expenses. 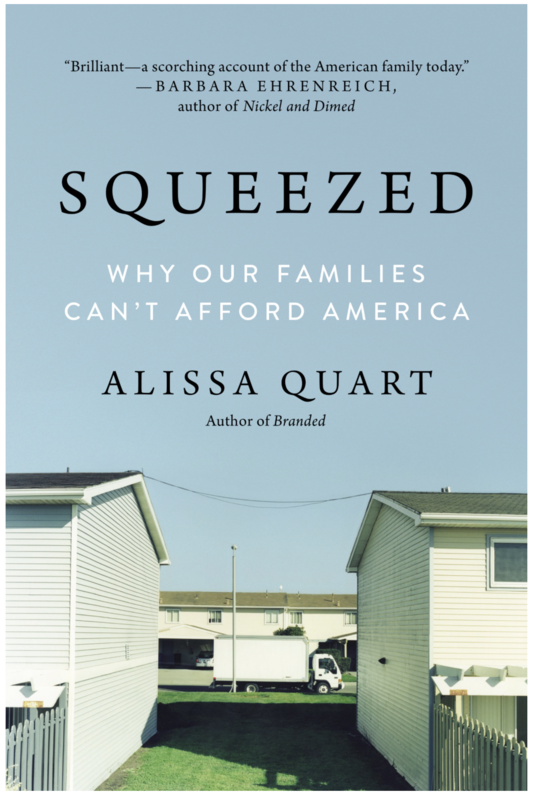 But Quart makes a compelling case that the middle-class squeeze is just the reality. I read this book from cover to cover. I came away from this book 180 degrees opposite of how I came away from Nomadsland. In Quarts book, I blame the interviewees themselves. For 1 example only, the lady who got her doctorate from Eastern Illinois University. Now, EIU is NOT even a quality UNDERGRADATE school. It is bottom of the barrel of universities in Illinois. They have NO right to offer a doctorate in anything. Instead of trying to become a faculty member of even lesser schools she talked about, her ego and doctorate prevent her from taking a HS job where she can earn $50K+ /year. In Nomadsland the people had the rug pulled out from under them thru no true fault of there own, although these people were not completely innocent. Life’s struggles aren’t new. As an older boomer, our first home mortgage rate was 14.25 percent and we only qualified, thanks to a builder, for a 2 percent buy-down! Younger readers may not know but the 80’s were the days of runaway, double-digit inflation. I’d trade today for those times, hands down. Being self-employed most of my life, there were many slow periods. I also paid both the employer and employee share of FICA taxes which often exceeded my income tax liability. Taxes then were also higher. We avoided the day-care expense trap having my wife stay home and eventually work for me part-time. While never making “big bucks” we managed to own our home, put two kids through private college and save for retirement. It is about establishing priorities and living within your means. I was also willing to do things and take risks others wouldn’t. Nobody gave me anything despite that I’m supposedly part of a “privileged” class. So I’m sympathetic to those who struggle today, but trust me…it’s nothing new. Thanks for the review of this important new publication. We needed good data on America’s middle class “squeeze” to speak to our clients. It can be argued whether people are worse off in general than in the past, but there is no question that the three spending categories mentioned – housing, higher education and health insurance – are significantly higher than a generation ago. A big part of the problem is that companies don’t value workers as they once did, even in a tight job market. My father Leo, who would have turned 99 today, was one of the ‘blue collar aristocrats’ of the 1970s. He bought a house, put two kids through college and retired well on a factory workers salary as I noted here. My parents made a $60k retirement nest egg last three decades thanks to the good benefits GM provided. Those were truly the good old days! As it happens, Prudential just put out a short document that puts some numbers to these trends. I find this entire issue horribly confusing. I agree in general with the premise that there is a growing divide between the rich and the poor, and that the middle class is getting squeezed. BUT…here’s just one example…when I was growing up we had 5 or 6 TV channels to watch, and had to get up and cross the room to change them. Now everybody has 100-200 channels, streaming movies, On Demand, and 55″ TV’s to watch them on. Of course all of this costs, but nobody wants to go without. So, TV has gone from being free to costing $100/month. That’s just one example; others include cell phones, SUV’s with GPS and built-in DVD players, McMansions, etc., etc. There’s simply more “stuff” out there than ever before, and people want it all. I believe that is the reason the middle class is struggling. Thanks for letting me rant! Correct! And if you can’t have what you listed you vote for Trump. I first want to say how much I enjoy and value your publications. While this is clearly an issue, it seems that the blog post somewhat overstates the result.